My third and final stop on my night photography tour of San Francisco was at the Bay Bridge. The cab ride from the Marina District to the Bay Bridge was pretty reasonable and much quicker than trying to take public transportation, which was non existant at 10:00 on a Sunday evening. The entire fares and tips were less than $40.00 for the three legs of my journey. Without the cabs, my night photography tour would not have happened. The Bay Bridge, while lesser known than the Golden Gate, is equally as beautiful as its more famous neighbor. Glowing bright lights outline the suspension cables of the double decker bridge. Leading from San Francisco to Oakland, the Bay Bridge makes its first connection at Angel Island. 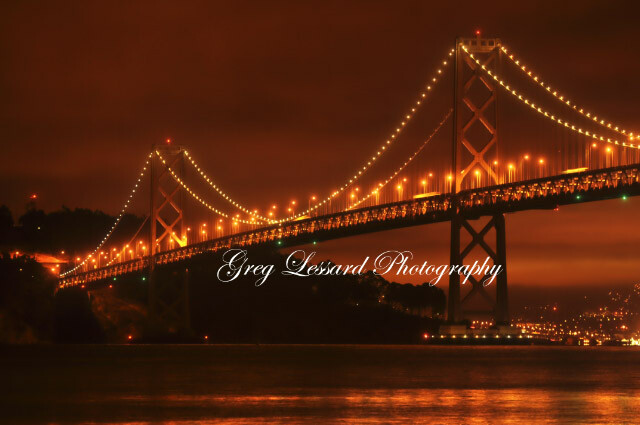 When I first saw the bridge illuminated at night, I was awestruck. It was amazingly beautiful! With Bay area fog socked in, the lights of San Francisco and Oakland reflected off of the fog to provide a beautiful hue to light the sky. After nearly an hour of photographing the bridge and San Francisco, I headed back to the hotel, very satisfied with a great photographic adventure. Last night I was welcomed by the Whaling City Camera Club at their monthly meeting. They invited me to discuss the basics of bird photography with them. It was a pleasure meeting many of the club members. Hearing their stories about bird photography and chatting about photography in general was great fun. Not to mention that they served a delicious homemade blueberry pie for snack! This is a popular presentation in which I discuss everything from equipment to photo techniques and the importance of studying bird behavior. My approach is to teach some simple techniques for making beautiful photographs of birds with affordable, versatile and portable equipment. After discussing the basics of bird photography, I present a slideshow of some of my favorite images of birds to show how I used the techniques that I presented earlier. I'd like to thank the Whaling City Camera Club and all of its wonderful members. I truly enjoyed meeting everyone. Thank you for making me feel so welcome! 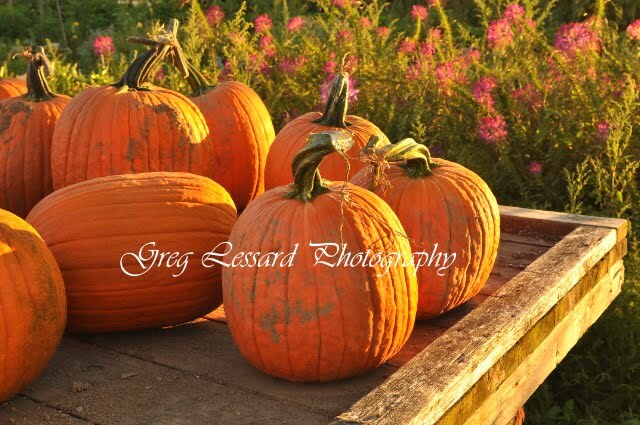 I will be giving this presentation again on October 19, for the South Shore Camera Club. 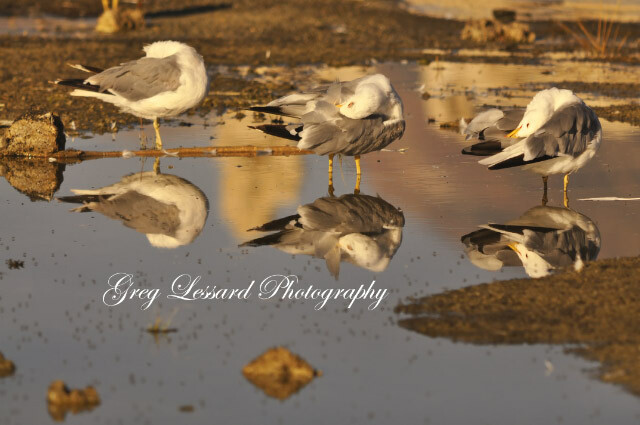 Image: California Gulls preening at Mono Lake, Lee Vining, California. 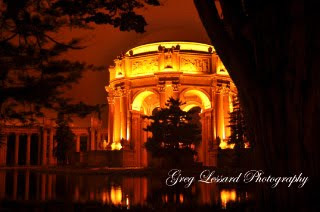 The Palace of Fine Arts was my next stop on my night photography tour of San Francisco. This beautiful palace was constructed as part of the Panama Pacific Exposiition in 1915. The residents of San Francisco were so enamored with this structure that they asked the organizers of the exposition to preserve it. I am so glad they did. It is simply fabulous! The palace is located approximately a 1/4 mile from Crissy Field. So it made sense to to walk there after photographing the Golden Gate. This time I wasn't so concerned about my safety. The palace is in the middle of a very nice neighborhood in the marina district. There were numerous people out walking their dogs. What a fubulous place to live! On a recent trip to San Francisco, I took a cab to Crissy Field. From this former Marine Corps air field, now turned recreation park, you can see a fantastic view of the Golden Gate. 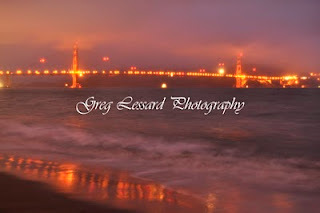 I was fortunate to arrive there before the fog had completely obscured the bridge for the night! Having scouted the location on the previous evening, I knew that the bridge would be reflected in the waves rolling onto the beach. I made numerous images trying to make one that I was satisfied with. My biggest concerns were for my safety. I was on a tiny peninsula that was quickly being engulfed by the rising tide. I was also constantly looking over my shoulder, hoping that I wouldn't get mugged. Fortunately, everyone that I had spoken to said that this was a safe location and it proved to be true! I used a 2 second exposure to blur the waves and allow the light to be bright enough to show the colors that I was seeing. This created an issue that needed to be solved. 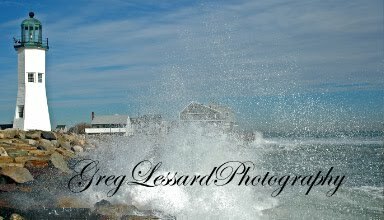 The wind was gusting quite a bit and creating significant camera shake. I planted the tripod legs deep into the beach sand and hung my heavy camera bag from the center of the tripod. This added some stability, but I was not convinced that it would be enough to stop the camera from shaking. So, I stood to the side of the camera to act as a wind shield and I used my remote cable release to trip the shutter. This helped me to create an acceptably sharp image despite using a long exposure in high winds. Seeing the Golden Gate in this beautiful light, while hearing the ocean waves crash ashore is a memory that I will never forget. 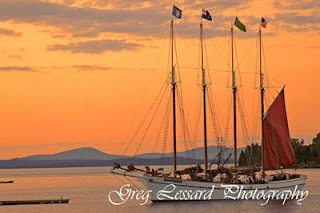 In Bar Harbor, Maine, the Margaret Todd has been providing summer tourists with the opportunity to sail on beautiful Frenchman’s Bay for more than a decade. The Margaret Todd is a four mast schooner that is 151 feet in length. With wooden decks, a white hull and red canvas sails, she is a beautiful sight to behold. Photographic opportunities abound on board the Margaret Todd. The red sails are absolutely eye catching. Ropes and tackles running up and down the masts material for numerous macro and abstract compositions. Some visitors are even lucky enough to have their photo taken while they help hoist the sails! In addition to the many images that can be made on board, the Margaret Todd takes her passengers through some of the most beautiful waters on the east coast. Island studded Frenchman’s Bay is a photographer’s delight. The famous porcupine islands start the show with fantastic views of their rugged shores. Sometimes, bald eagles can be spotted among the islands, providing a real treat for adventurous tourists. Not to be missed on the sail through Frenchman’s Bay is scenic Rum Key. This tiny island is hidden from prying eyes on Bar Harbor. During prohibition, rum smugglers would do their surreptitious business at this clandestine isle. Today reputable seals are often seen basking on its shores. Providing some of the grandest views of all is Mount Desert Island. With the tallest mountains on the eastern seaboard of North America, Mount Desert Island is truly resplendent. Cadillac Mountain rises 1532 feet, offering tremendous scenery. At the foot of Cadillac Mountain, Bar Harbor looks like a perfect resort town. During her journeys, the Margaret Todd also passes many other boats. As she returns to Bar Harbor, she dwarfs sail boats and lobster boats alike. 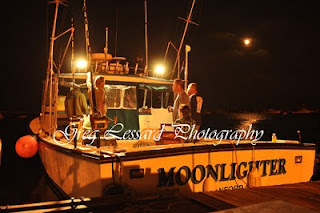 These smaller vessels are very colorful and afford images that have plenty of New England character. Sometimes the sizeable Margaret Todd is dwarfed by enormous cruise ships. The old fashioned schooner sailing by an ultra modern cruise ship is a striking contrast. 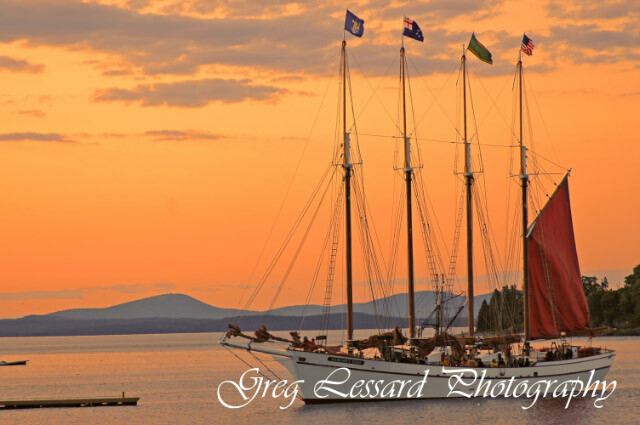 The most charming time to sail aboard the Margaret Todd may be during the “Sunset Sail”. The finest light of day will illuminate the islands, waters and wildlife of Frenchman’s Bay, for outstanding photographs. Musicians frequently perform on the “Sunset Sail” adding a romantic flair to the evening. With some luck, visitors may even glimpse a dolphin swimming into the setting sun. Returning from a pleasant sail, one can not help but feel relaxed and refreshed. A short journey on the Margaret Todd can take you miles away from your cares and worries. This month’s tip: Making sharp images aboard a sailing vessel can be difficult. The constant rocking motion of the ship can make for many blurred shots. Bumping your camera’s ISO up to 400 or higher will help make your images crisp and clear. Join me for a photography workshop in Bar Harbor and Acadia National Park! For more information, visit http://blog.greglessardphotography.com/2011/03/fall-photography-tour-in-acadia.html or call 781-837-9400 for an itinerary. 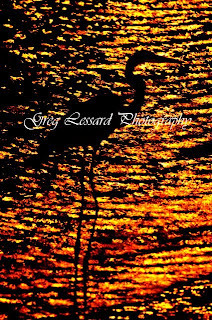 This great blue heron was fishing in Plymouth Harbor last night. As it fished in the shallows, it moved in and out of the glow of nearby street lights. The water was fairly calm with an intermittent slight breeze. 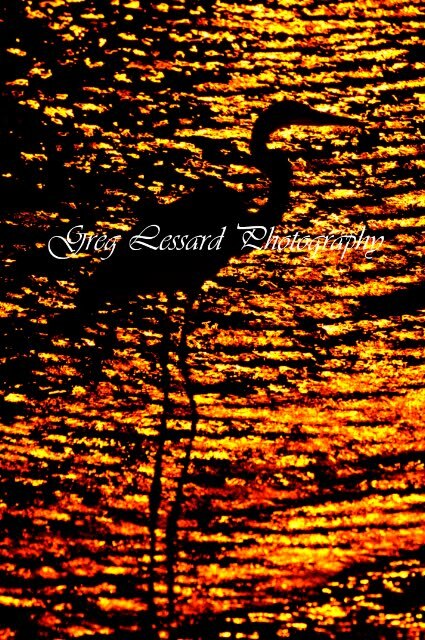 When the wind blew, the reflections of the street lights would stretch further along the water and surround the heron with golden sparkles of light. I spent nearly an hour photographing this heron. During that time I moved up and down the sidewalk along the waterfront, attracting the attention of many patrons in the nearby Weathervane seafood restaurant. Soon there was a large crowd of people wondering what I was photographing. My dad and I did our best to educate everyone about the great blue. We met people from as far away as Pennsylvania! My dad also pointed out a juvenile night heron that was camouflaged amongst barnacle covered rocks on the shore. Its speckled white and brown feathers perfectly matched the barnacles. My dad never ceases to amaze me with the birds that he can spot. I am sure that 99% of all other people would never have seen the immature heron. There were thousands of fish swimming in the harbor. Both birds were dining on plenty of fresh seafood. The question of the night was do these birds naturally fish at night or was the light pollution of downtown Plymouth altering their behavior? Unfortunately, I don't yet know the answer to that question. As to the photography, I was trying to silhouette the great blue against the golden flecks of the streetlight reflected on the water. In the end I needed a little help from NIK Color Effects Pro to get the exposure I desired. I used a combination of the polarization, skylight and midnight filters. It was a great experience to shoot some night photography with these birds! Last night, my dad joined me to chase the full harvest moon. We ended up in Plymouth Harbor. At first we were disappointed by thick clouds and fog. So, we went to the Lobster Hut for dinner. 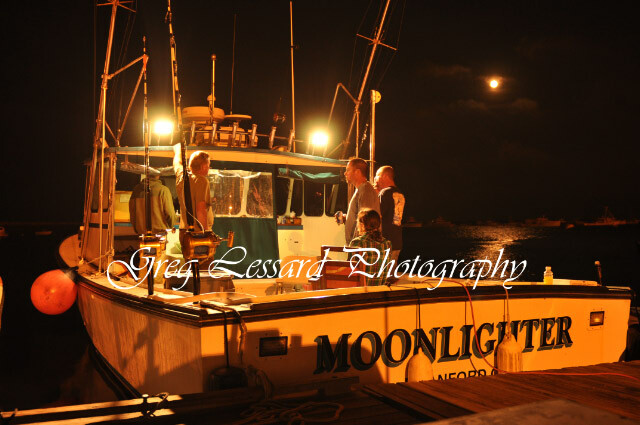 While eating some fantastic fried scallops, the moon came out and my dad noticed one of the boats in the harbor was called the "Moonlighter". Not one to miss an opportunity, I approached the boat's captain. He invited me to make photos of his boat. Afterwards, I handed him my business card. Surprisingly, he recognized my address. He said, "My best friend John lives on that street." Well, John happens to be my next door neighbor. What a small world! 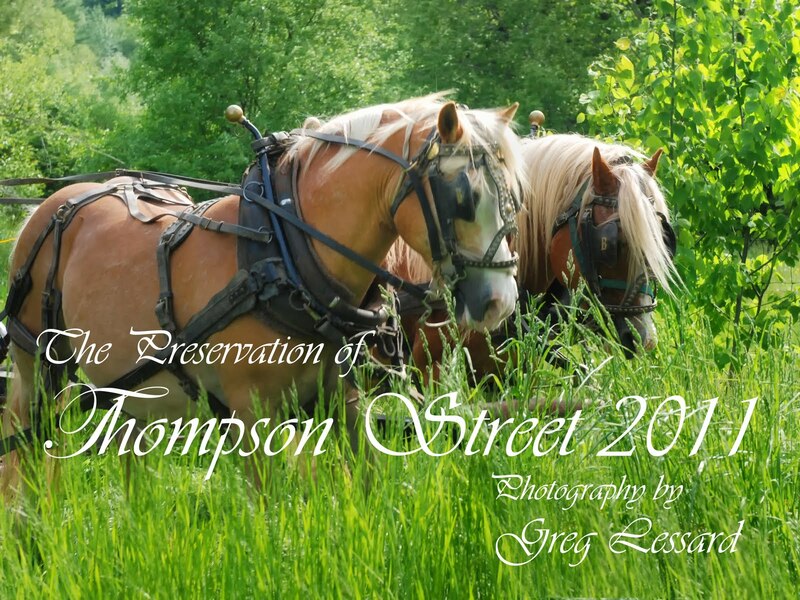 The 2011 Thompson Street Calendar will be available this weekend at the Middleboro 4H Fair on Saturday, September 4, from 9am-3pm. They can be purchased for $15. These beautiful 12 month calendars make a fantastic gift, especially for family and friends who no longer live in Middleboro. Last year, calendars were sent across the country. This year, requests have already come in from Texas and California! I photographed this calendar for the Committee for the Preservation of Thompson Street. This local group is actively involved in trying to preserve their rural neighborhood from threats of mass development. Thompson Street is one of the most beautiful neighborhoods on the south shore. It has been my priveledge to photograph this neighborhood over the last three years. Please visit the 4H Fair and purchase your calendar on Saturday, Sept. 4!